The AFC South had to win a game on Sunday, because the Jaguars and Texans played each other. One was all it got. In addition to that laugher (Jacksonville dominated Houston 29-7), the Colts got humiliated 47-9 by the Rams and the Titans lost at home 26-16 to the Raiders. On the college gridiron, it has been a tough start to the season for Ohio State and Florida State-among others. Tom Savage . The Deshaun Watson era did not take long to get underway in Houston. Savage lasted all of one half, losing two fumbles and going 7-for-13 with an anemic 62 passing yards. Trailing the Jags 19-0 at halftime, the Texans went with Watson over the final 30 minutes. The former Clemson star did not exactly set the world on fire, but he as better than Savage: 12-for-23 for 102 yards with one touchdown and one interception. He also rushed for 16 yards on two keepers. Houston is a +3 underdog at Cincinnati on Thursday night. New England Patriots . At least right now, the 2016 season ain't walkin' through that door for New England. The defending Super Bowl champions lost Julian Edelman for the year with a torn ACL during the preseason and they lost their opener-at home-42-27 to Kansas City this past Thursday night. 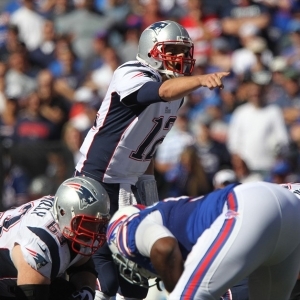 Tom Brady completed just 16 of 36 passes for 267 yards without throwing a single touchdown. The Patriots' defense watched Chiefs' quarterback Alex Smith have his way to the tune of 368 yards and four touchdowns. New England is a +400 favorite to win the Super Bowl. Ohio State . Oklahoma quarterback Baker Mayfield planted his school's flag in the middle of Ohio State's field following the marquee matchup of college football's second weekend. Of course, if the Buckeyes don't like that, they should have prevented it by playing better. The Sooners went on the road and hammered Ohio State 31-16, outscoring the home team 28-13 in the second half after being locked in a 3-3 tie at the intermission. OSU signal-caller J.T. Barrett completed only 19 of 35 passes for 183 yards and the Buckeyes lost the time-of-possession battle by almost 11 minutes. Ohio State is a -30 home favorite over Army on Saturday. DeAndre Francois . Florida State will not win a game until at least Sept. 23. The Seminoles lost their opener 24-7 to Alabama, had this past weekend's date with Louisiana-Monroe cancelled due to Hurricane Irma, and rescheduled this week's showdown against Miami (FL) for Oct. 7-also because of Irma. As for Francois, he won't be winning any games this season. The sophomore quarterback suffered a torn patellar tendon late in the fourth quarter the Crimson Tide and is out for the year. Francois passed for 3,350 yards as a freshman and accounted for 25 total touchdowns. "He's very disappointed," head coach Jimbo Fisher assured. "He's a guy that wants to play, but he also wants to be there with his teammates. He's very down. Not just for himself, but for his teammates." FSU is +2800 to win the National Championship (Bovada Sportsbook). Los Angeles Dodgers . Not one, not two, not three, not four, not five, not six…. No, the Dodgers-yes, the best team in baseball-have lost 10 games in a row. Since Clayton Kershaw blanked San Diego in a 1-0 victory on Sept. 1, L.A. has not found the win column. It dropped the last three against the Padres and then got swept by Arizona (three games) and Colorado (four). The Rockies went into Los Angeles and scored 28 total runs during the series, most recently prevailing 8-1 on Sunday. L.A. still has a nine-game lead over the Diamondbacks in the National League West and leads Washington by four games for the best record in baseball. The Dodgers are +275 favorites to win the World Series. Liverpool . In a battle between two clubs hoping to remain tied atop the English Premier League table, Liverpool was no match for Manchester City this past Saturday. The Sky Blues dominated at home via a 5-0 decision, capitalizing on an opponent that was reduced to 10 men when Sadio Mane was sent off with a red card in the 37th minute. Man City and Manchester United are out in front in the Premier League with 10 points, while Liverpool is tied for fifth with seven. "Of course we can't neglect the performance after that-we have to keep it in mind," manager Jurgen Klopp explained. "But we have another game (in the Champions League) midweek when we can prove ourselves again. That's probably a good thing. The game comes early and we can put things right; change it again.'' Manchester City is a +125 favorite to win the EPL title. Roger Federer . There has still never been a Federer vs. Rafael Nadal showdown at the U.S. Open. For the most part it has been Nadal's fault for losing too early in New York, but this time it was on Federer. Just one match away from another chapter in one of the sport's greatest rivalries, the 36-year-old Swiss lost to Juan Martin Del Potro last Wednesday night. Thus it was Del Potro-not Federer-in the semifinals against Nadal. The top-ranked Spaniard took care of Del Potro and eventually captured his third U.S. Open title by beating Kevin Anderson 6-3, 6-3, 6-4 on Sunday afternoon. Nadal is a +350 third choice to win next season's Australian Open ( Bovada Sportsbook ).